Last month we introduced ourselves to Sketch App 3 by learning how to mock up a credit card detail app screen and export the necessary assets, which can later be used in Xcode when building an actual iOS application. If you didn’t catch the tutorial or you’re not very familiar with Sketch 3, here’s a quick summary. 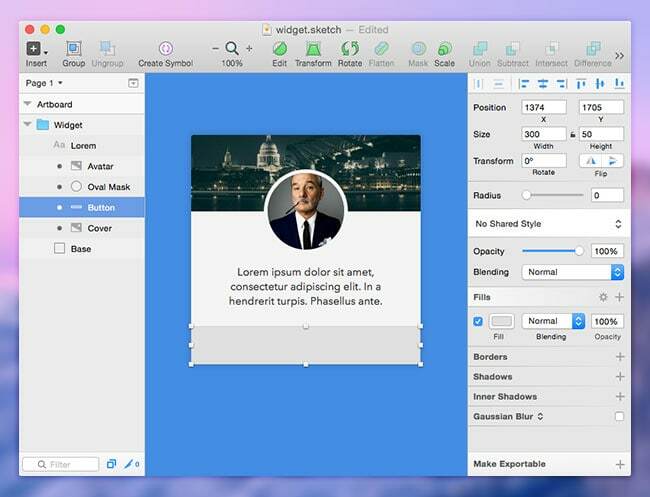 Sketch App 3 is a design tool made by Bohemian Coding. It arrived on the market around the same time that Photoshop users became increasingly frustrated with the complex UI and Fireworks announced that it would be discontinued, so if you’re a user interface designer and a Mac OS X user (sorry Windows), head on over to the Bohemian Coding website and download a free trial of Sketch App 3. As I mentioned briefly, Sketch is very useful for creating, organizing and exporting UI assets, but even when the final design is not expected to manufacture any, we can still use Sketch to create mockups as a POC (“Proof Of Concept”). Is this a waste of time? No. What Will We Be Making? In this tutorial, we’ll show how to design a modular profile card using only the simplistic intuition of the Sketch App interface, and even though we won’t be using any of the assets in an actual website design, we’ll experience first-hand how much time can be saved by extending our ideas onto a digital canvas before we create the real thing. You are of course welcome to adapt this design to suit a mobile application; I’ll refer to that more later on. Here is a screenshot of what we’ll be making. It’s not too complex, but the lessons that you’ll learn will help you develop the design if needed. Here are some comparative notes about Sketch vs. sketching. A hand-sketched version is quicker and allows us to reiterate various alternatives quickly. It also allows us to concentrate on the user experience without worrying about styles. However, a digital template (or archetype, prototype) will offer more aesthetic value. 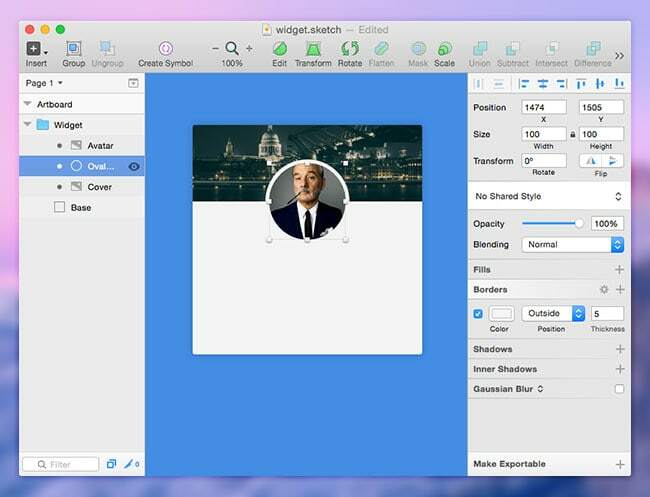 With Sketch, we can copy the styles of a layer as CSS into the clipboard. Both. Prototyping is incredibly important to any design workflow, and not only can we reiterate quickly by hand, but we can take our best ideas and extend them onto a digital canvas for further validation. Once a mockup is validated, it’s blissfully easy for a developer to left-click and copy the styles (as CSS) to their clipboard. 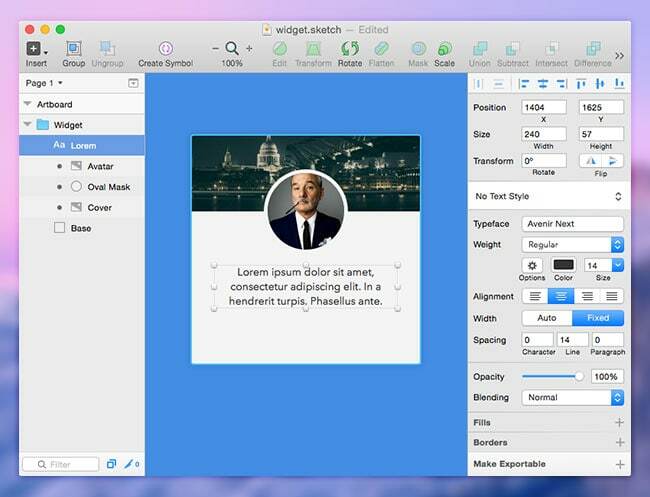 Sketch helps build a bridge between designers and developers. Press “A” on the keyboard and draw out an artboard. In the right-hand sidebar (also known as the inspector) you’ll notice that there are settings that have become available. When you’re focused on a layer this will house the styles for that layer, but since we’re focused on an artboard the available settings differ slightly. Give the background a color first — this won’t appear in the export but we’ll use it to help us see the widget better, since the widget will be rather light and won’t be apparent on the default white background of Sketch. 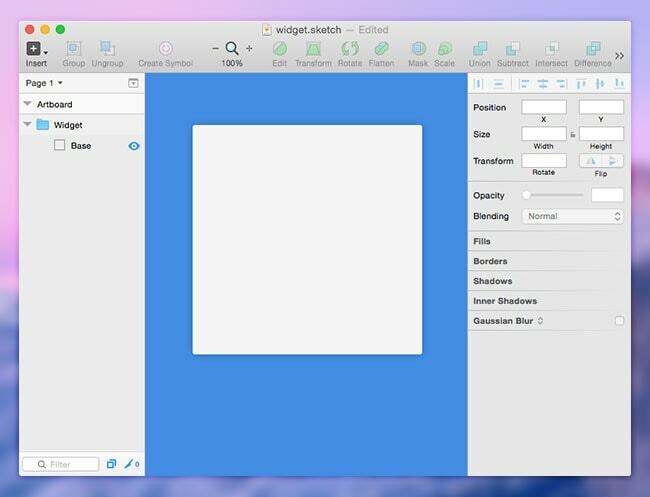 Much to my dismay, Sketch doesn’t currently offer a way to switch to a darker UI. In the left-hand layers sidebar, double-click on this new artboard and rename it to “Artboard” — we’ll make it a habit to conveniently rename our layers as we move forward with the tutorial. Further into this tutorial, we will encounter an issue when we insert a full-width image. We will require the cover image to also have a top-left and top-right radius, but since there is no way to add radius to an image in Sketch App we will need the Base to act as a mask. With CSS we can accomplish this with overflow: hidden, or even add border-radius: 3px to the image, but in Sketch we’ll need to left-click on the Base layer (from the sidebar) and select Use as Mask. So far, nothing exciting. For this next step however, I’ll show you how to use the Sketch Toolbox to insert random images into the artboard. Placeholders don’t have to be annoying; instead we’ll use the Day Player Plugin to generate images of a specified width and height. We’ll do this twice, once for the cover image and again to create an avatar. Lets start by installing the Sketch Toolbox. Once that’s installed, search for the “Day Player by tylergraw” and click the install button. We can navigate to Plugins in the Mac Toolbar to access settings for the utilities that we’ve installed. In this case, select Day Player → Unsplash.it and create a 300 x 100px image. For this to work we’ll need to select the Widget group in the layers sidebar so that Day Player knows where to insert our image. You might have noticed that the image has rounded corners already, this is the intended result of the layer mask underneath which is represented with a bullet next to the layer’s name. We should call this layer “Cover.” In the following screenshot, observe how the different types of layers (artboard, group, masked, non-masked) are represented in the layers sidebar. Lets try again and create an avatar. Draw an oval shape to act as another mask if we want our avatar to be circular. Press “O” and then hold “Shift” while drawing out a circle and stop when the dimensions reach 100 x 100px. Remove the Fill, make sure the Border is “#F4F4F4, Outside, 5”, and then drag the oval (we’ll call this “Oval Mask”) until it auto-snaps to the vertical center of the widget and its half-hanging outside of the cover image. Drag the text box until it snaps to both the vertical center of the widget about 20px below the avatar. Highlight the user’s name, change the Weight to “Demi Bold,” then click on options and change the Decoration to “Underline.” Not only is the name more apparent now, but it also tells the user that it will link to more information. Since the bio text is center-aligned, a follow button that is also center-aligned might be initially confused with body text. Not only that, but negative actions such as “back” are commonly situated on the left. By choosing to interact with the widget the user is attempting to do the quite the opposite, move forward. A right-alignment with a forward arrow will illustrate that, or alternatively an icon that represents “follow” if the widget isn’t intended to take the user offsite. Tip: Remember that this card design can have many different uses. It could be an embeddable widget used offsite, a single screen in an app, or just one simple module in a website design. Perhaps we’ll want to create a unified design across platforms! If we were coding this website (or app) we would add to the user experience by taking the user to a new webpage or switching out the forward icon for a “tick” upon successfully following the user. Depending on your use-case, remember to use icons descriptively. Now we can use this mockup to build a real version. If you want to use any of the layers in an actual application it would be as easy as selecting the layer in the layers sidebar and clicking on “Make Exportable” in the bottom-right corner. 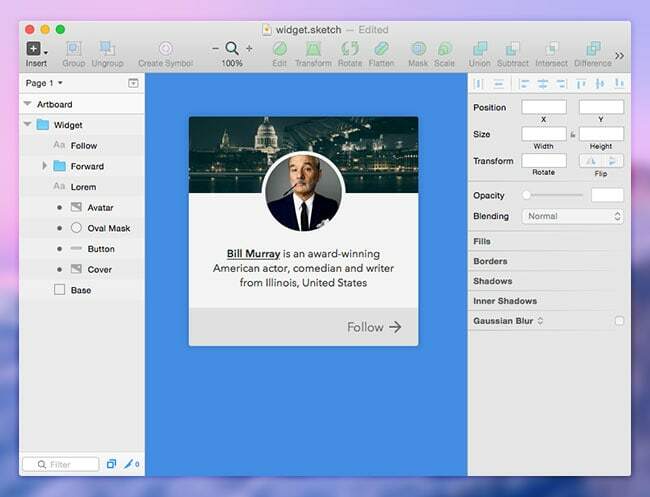 You’ll be able to specify the file format, the resolution, and even a suffix for the filename – this is one of Sketch App’s most critically acclaimed features. 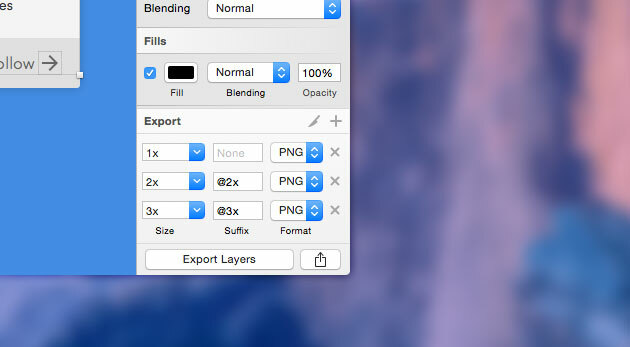 Tip: Hold CMD to select multiple layers to export all at once. While we have reiterated over the things that we learned in the last tutorial (styles, templates, exporting, etc), we learned some new tricks such as how to use layer masks and the Sketch Toolbox. If you’d like to experiment with Sketch Toolbox some more, here are some useful extensions that I would highly recommend. Send to Slack will let you send screenshots of your Sketch App designs directly into a Slack channel for your colleagues to observe and offer feedback on. Content Generator Sketch Plugin is similar to Day Player, except that it will offer random dates, text and locations, which would be very suitable for a more complex modular widget. 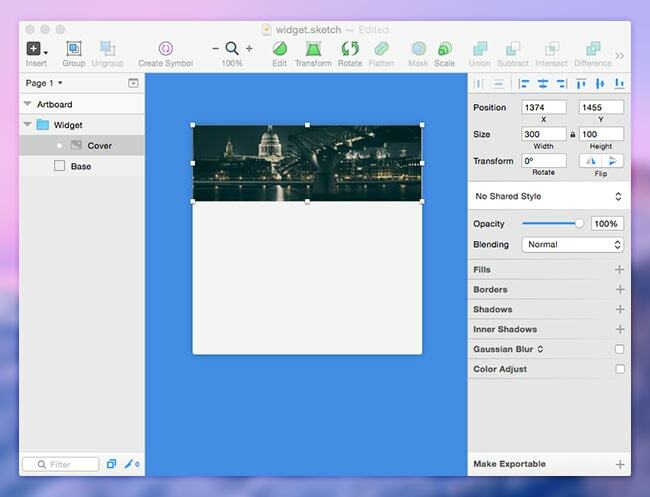 Aeiconizer will automatically resize artwork into the correct sizes for an iOS app icon. CSS Buddy allows you to style layers with CSS, which is quite suitable for web designers transitioning into Sketch App or web developers needing to make minor changes. Founder, curator and editor of Airwalk Design, creative director of Airwalk Studios, entrepreneur, designer, traveller, lover of Sketch App and nerd. Follow me on Twitter! There is an analogue for Windows?